The eInk (a.k.a. Electronic Ink ) in the Kindle eInk pearl creates electronic pages that look a lot like printed paper with dense black type on a pearly white background. The letters don’t look pixelated even under magnification. How does eInk work? I researched and simplified the explanation into something easily understood. Remember the classic toy the Etch A Sketch? 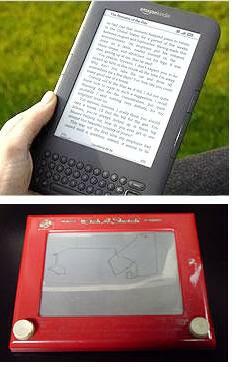 To my mind, the Kindle with eInk is the Etch A Sketch of the 21st century. When you turn the Etch A Sketch knob a stylus scrapes aluminum powder off the screen which results in a gray line. Turn it upside down and shake, the aluminum powder recoats the screen to erase the lines. eInk works with a similar concept, executed in a far more sophisticated electronic manner. Instead of aluminum powder, eInk used microcapsules, instead of the stylus, electronic circuitry and electric fields are used. 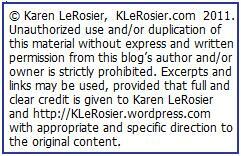 Of course, my explanation is highly oversimplified. More information about this technology can be found at www.eink.com.